Fremantle CODA architects will be participating in the City of Fremantle PARK(ing) Day, which will be held this Friday September 18. They have connected the day with their own fundraising activities and are hoping to raise money for the Fremantle Migrants Centre. For the last few months CODA has been raising money internally to assist the centre in their Pursuit for a Ute to be used to help welcome and settle people in WA. For each cake that CODA staff eat in the studio (and that’s a lot!) they get asked to make a gold coin donation. On PARK(ING) DAY CODA will give away little potted lettuce and tomato seeds at their parklet for a gold coin donation. They have been supported by Dawsons, The Green Life Soil Co, Supafresh Leaves and Creation Landscape Supplies, who have all contributed to make it possible. 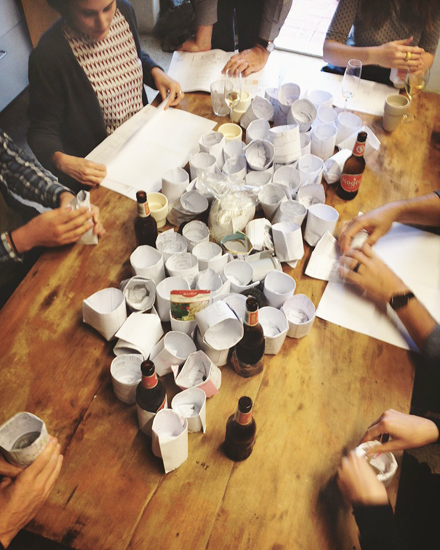 The CODA team have been madly making little recycled pots all week long, as the photo shows. Their parklet will be decorated with plants and hay bales and will be a fun place to stop off and visit. It looks like the parklet will be located near Il Cibo in Market Street.